Is there anything real left in our world anymore? No, argues Creative Control. In the world of the film Creative Control, nothing is real. The whole world is black and white, for a start. Affairs revolve around an ad agency, an company belonging to an industry that is all about selling folks false dreams. People take drugs to escape reality. People are insincere in business. People cheat on their best friends. And into this reality comes a new invention of a virtual reality visor, through which our antihero for the duration of the film can fulfill his sexual fantasies with the woman he cannot otherwise engage (because she's the girl of his so called "best friend"). And in this world where nothing in real, that virtual world is the only thing that is real. We know that for sure because it's the only thing in color. 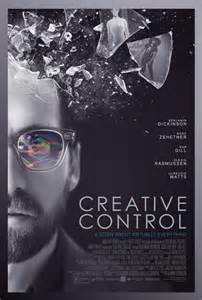 Creative Control goes to extremes, and overdoes it in the process, in order to tell us something about the world full of fictions, myths and lies that we live in. The result is contrived and too "in your face" to properly engage.